The Electoral Reform Alliance has urged experts from Japan and the European Union not to shy away from addressing “severely undemocratic” provisions of Cambodia’s new election law when they meet with National Election Committee members next week. The new bipartisan NEC, approved in April, this week set up an ad hoc committee to coordinate work with donors such as the EU and Japan, which have agreed to help the body organise new, digital voter lists, NEC spokesman Hang Puthea said yesterday. 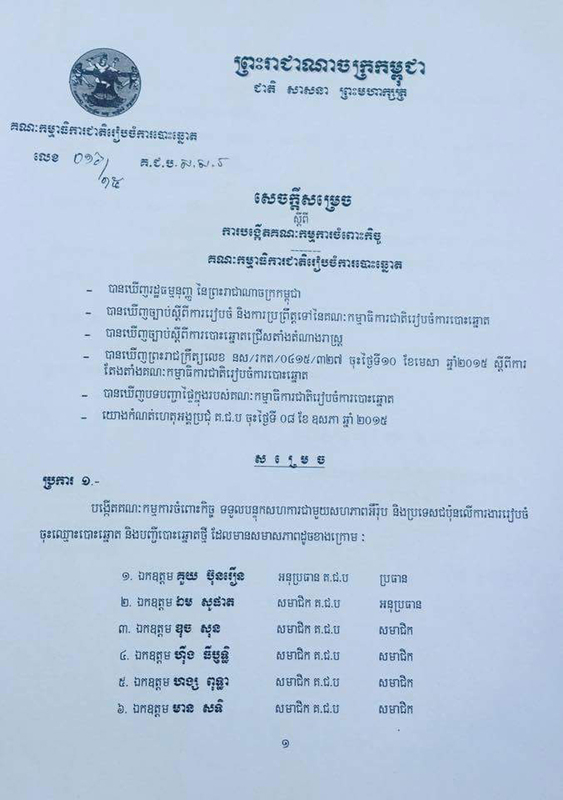 The committee, announced on Monday, will be led by NEC vice president Kuoy Bunroeun and include Em Sophat, selected deputy of the committee, Duch Son, Hing Thirith, Mean Satik and Puthea. It will meet the EU team next Wednesday and the Japanese delegation on Thursday to discuss voter registration ahead of commune and national elections in 2017 and 2018, respectively, Puthea said. 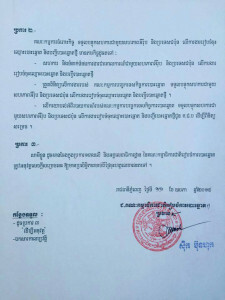 “We want to use computers in every commune to identify voters’ thumbprints and photos to prevent repeat registration and confirm the location of registration in order to avoid the problem where people lose their names, register again and they do not know where they can vote,” Puthea said, adding the digital system would reduce irregularities. Although welcoming the support to modernise the voter lists, Koul Panha, executive director of election watchdog Comfrel, said it was imperative that Japan and the EU also use their roles to advise the NEC against using the new election law to suppress citizen’s political rights. 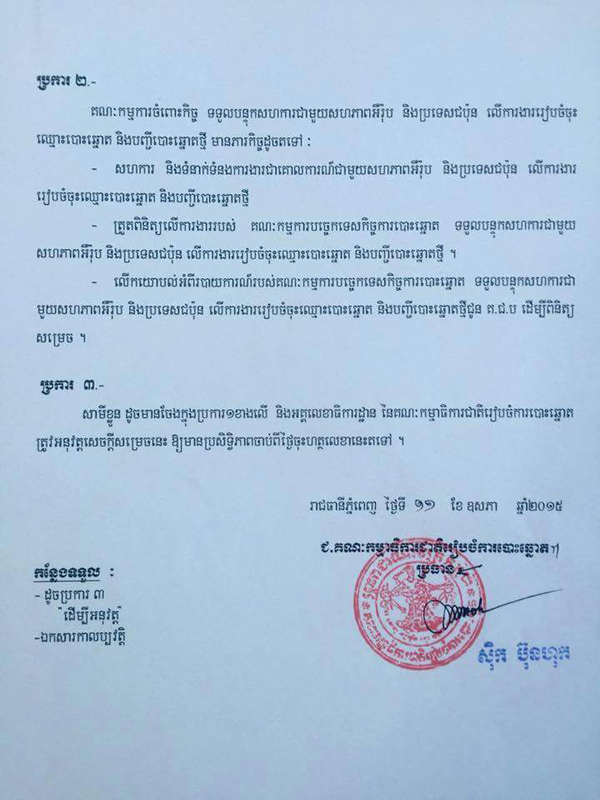 “They need to work not just as technical support, but work to make sure there is a free and fair environment in Cambodia for elections,” said Panha, also an ERA spokesman, pointing to provisions that restrict NGOs and levy fines for “insulting” political parties or candidates. According to a study by the ERA, digitising the Kingdom’s voter system and registering more than 10 million eligible voters will require a team of 2,500 people, cost almost $17 million and take about a year. 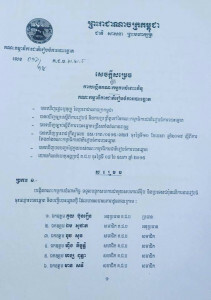 Jean-Francois Cautain, ambassador for the EU delegation to Cambodia, welcomed the establishment of the NEC’s committee to work with donors but said it was too early to confirm exactly where the EU’s support – spelled out under its 2014-2020 assistance program to Cambodia – would be directed. “Next week, an EU mission will be coming to discuss with all stakeholders how the recommendations on elections of the previous EU missions have been or are being included into the current electoral reform process,” he said. The Japanese Embassy could not be reached yesterday. Puthea said if the EU and Japan didn’t provide financial support for the modernisation, the NEC would seek other partners. He said the NEC would begin compiling new digital voter lists in September, predicting four months of work. As well as working with donors, the NEC’s ad hoc committee will also assess reports by the NEC General Secretariat’s technical election committee before passing them to the committee’s nine members for approval. Puthea said the NEC had not yet set a date to choose new secretary general and deputy secretary general for the General Secretariat. He said the fact that old staff remained in their posts would not impact the new NEC’s work.